The Liberal Bee Jays will finally ride in comfort this summer. 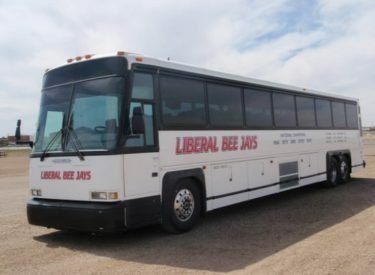 The Bee Jays purchased a 55 passenger tour bus. The bus is similar Seward’s bus. It has six TV’s and a VCR as well as heat and air conditioning. It is an MCI Motorcoach Incorporated. BJ President Nathan McCaffery says he is excited for the program. "The Bee Jays organization during the offseason has purchased a new bus to replace the bus that we had. This is a legitimate bus. It’s a 55 passenger tour bus. The interior is nearly immaculate. It’s parked outside J&R Sand right now for anyone who wants to buzz by their and take a look at it. It looks really sharp." Stickers adourn the side of the bus signifying the five NBC World Series championships from 1968, 1979. 1985, 2000, and 2010 on the side of the bus. Other stickers recognize famous former BJ’s like Rocky Roe, Mike Hargrove, Phil Garner, Ron Guidry. Doug Drabek, and Nick Leyva. The bus is paid for through donations from organizations and people in the community in Liberal and parents from one of the players from the 2010 team. The bus is completely paid for.